Members of the Summit Tigers girls rugby program's top team pose for a photo on Saturday after winning the Palmer 7's tournament championship at the U.S. Air Force Academy. Summit High School girls dive for the ball in the Green-White rugby scrimmage on Aug. 30 at Tiger Stadium in Breckenridge. This past weekend, the Tigers program fielded three teams at the Palmer 7's tournament at the U.S. Air Force Academy in Colorado Springs, where Summit's top team won the championship. 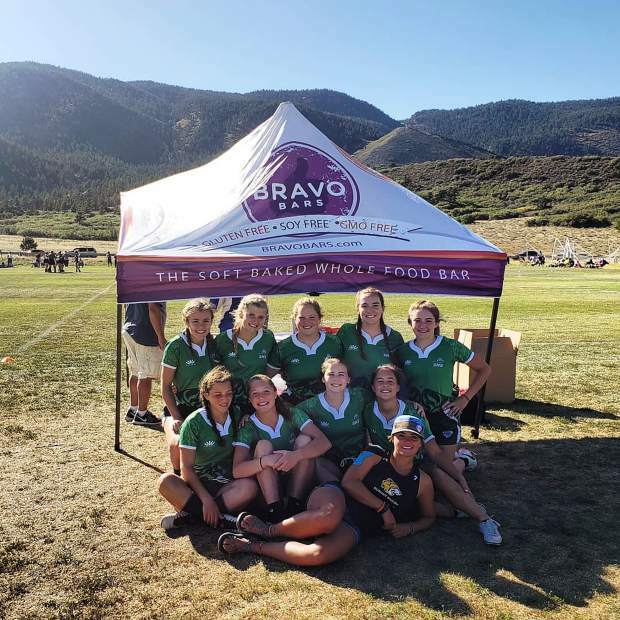 Despite the rust of not having played last weekend combined with Summit High Homecoming’s pomp and circumstance, the Summit Tigers girls rugby team won the Palmer 7’s Tournament at the U.S. Air Force Academy in Colorado Springs on Saturday. The top Summit High School squad battled through some mediocre play early on Saturday en route to defeating Arapahoe High School (Swarm) in the day’s final match for the tournament title. Saturday’s tournament action consisted of two different competitions, and the Summit program fielded two teams in the top tournament that included the top-eight teams from across the state. Summit’s second side took third-place overall in this A-level competition, with a pair of impressive wins over Fort Collins and Palmer. The breakthrough victories for the team came after they bounced back from a first-game loss to Arapahoe High School. Playing in the tournament during the school’s homecoming weekend, the Tigers ruggers settled in and were led in scoring by veteran Clara Copley. Barth pointed to Copley, Nicole Kimball and Heidi Anderson as a powerful trio on Saturday in leading Summit’s A squad to the tournament title. The effort required some mettle to come back versus Denver’s East High School, as the Tigers found themselves down twice in that game before they “kicked it into gear,” as Barth said. The Tigers also fielded a third team in the nine-team secondary tournament on Saturday. Barth said this developmental Summit side had a good day, finishing in sixth place. The Summit program and its multiple girls rugby teams will next be in action this Saturday from 9 a.m. to 3 p.m. at the Chapparal Wolverines’ tournament. The Summit Tigers high-school aged mountain bike team took third place in the Colorado High School Cycling League’s Division 1 competition at Sunday’s Granby Ranch Roundup. The Tigers had 32 different riders compete across varsity, junior varsity and freshman disciplines at the event, and were led by Tai-Lee Smith’s fourth-place finish in the varsity girls race. Smith raced to a time of one hour, 26 minutes and 23.89 seconds on the three-lap course, just 16 seconds off of a top-three pace. With the fourth-place finish, Smith earned 547 points for the Tigers, the most of any individual racer on Sunday. The sophomore Smith also ranks in fourth place on the season for the varsity girls Division 1 racing category. The Tigers, in total, amassed 6,942 points on Sunday, behind Division 1 winner Boulder (7,870) and Fairview (7,271). Smith’s fellow varsity girls rider Opal Koning contributed in a big way to that point total on Sunday. Koning’s 10th-place finish in 1:33:58.44 in the varsity girls Division 1 race earned the Tigers 502 points for the team competition, the second-most on the day for any of the top-15 point-earning Tigers riders. Other Tigers varsity girls mountain bikers who earned the team points on Sunday included Elsa Bates (16th, 1:36:29.89) Jazlyn Smith ( 19th, 1:37:32.16) and Grace Karoly (28th, 1:49:18.25). Summit boys junior varsity rider Lasse Konecny earned the team its second-most points on the day, 521, via his third-place finish in the boys three-lap junior varsity race (1:16:23.86). Summit shone in the JV boys race on Sunday, with a crew of riders joining Konecny in the top 30 finishers for the race, all earning crucial team points for the Tigers with their individual performances. Following Konecny were Finn Remias (6th, 1:19:31.93), Max Bonenberger (10th, 1:20:51.58), Ryan Adis (16th, 1:23:44.38), Caleb White (21st, 1:25:17.36) and Steven Jardim (30th, 1:27:07.26). In total, the JV boys group earned Summit a total of 2,688 of the team’s 6,942 points. In the two-lap freshman girls race, Summit’s trio of Victoria Uglyar, Samantha Hessel and Marin Ward had another strong showing, coming in second, sixth and seventh places, respectively. For the entire season, Ugylar is just 10 points back of Fairview’s Keira Bond for the Division 1 freshman girls series points lead, 1490-1480. And in the two-lap JV girls race, Summit junior Aislinn Wehrman earned the team 567 points with her 10th-place finish in 1:09:11.99. The Tigers riders will next compete at the fourth event of the season on Oct. 7 at the Haymaker Classic in Eagle.